Years in Business – It takes time to get proficient making wood veneer, as well as amassing the right wood species products to make the veneers from. Who Have They Supplied? – While hobbyists are detail oriented, of course, major furniture manufacturers can be downright picky. If you get your wood veneer packages where they were supplied, there is a good chance you’ll see some pretty fine quality. Vast Selection – No two projects are the same and the more selection your source has the more likely you could make more than a hundred projects that have different detail. Availability – It never hurts to work with a company whose wood veneer packages are readily available around the world in retail marketing partner stores, wholesale woodworking companies, and online. Here at Sauers & Company Veneers, we have served the wood veneer needs of large furniture manufacturers and hobbyists for over 50 years. You can count on cutting accuracy, consistent high quality, and top-notch customer service. 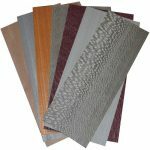 We offer wood veneer packages, edge banding, decorative inlays and veneer sheets with more than 125 species in six different backing options. Our products are sold all over the world and you are always welcome to call us directly.